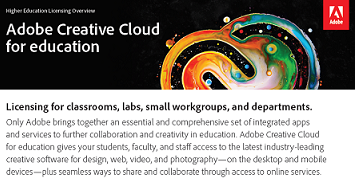 1.Creative Cloud for teams All Apps Team Licensing Subscription K-12 School Device License (25 License minimum order quantity). 2.The new Creative Cloud for enterprise All Apps Enterprise Licensing Subscription K-12 School Named License (500 License minimum order quantity). This license enables students to work away from the school computers. Although Adobe’s literature may indicate a minimum order quantity of 100, in the UK the minimum order quantity is 25 for the K-12 School Site Device License. Schools who may require individual Creative Cloud licenses for a member of staff and who have a K-12 site license will benefit from being able to subscribe at the lower price band a K-12 site license will entitle them to. 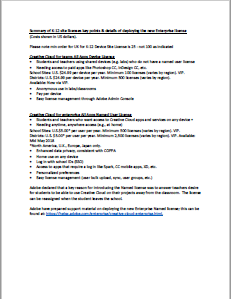 The below Datasheets contain useful information about K-12 Schools Licenses. Please see the Adobe Creative Cloud licensing overview above for full details. Device licenses are not linked to an individual with a personal login; they are installed on a device. Device licenses do not include cloud services and may only be installed on one device. Ideal for use in a classroom or on an office computer shared by a number of users. Named licenses provide allcloud services. They require a login. They include Cloud Services and Typekit (https://typekit.com/). They can be installed on a single user’s desktop and the same user’s laptop (often translated by non-profit organisations to home computer). This could be two laptops or two desktops, one could be a PC and the other a Mac. With both types of license the software is installed on the computer; you do not need to be connected to the internet to use Creative Cloud applications. You will not receive a bill out of the blue. Creative Cloud licenses run for 12 months. A few weeks before your anniversary date Entec will contact you and, if you wish to renew, we will organise this for you and invoice you for a further 12 months. Subject to any fluctuations from Adobe the cost to renew will be the same as for the previous year. You get 30 days grace at the end of the twelve months to give plenty of time to renew, after which the software will stop working. please give us a call on 01462 499 599.